In the post FIFO and LIFO queues in python I shown how to use queues in python 3. Python provides also priority queues. 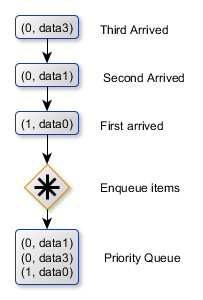 You can use such a queue when the processing order of the items in a queue needs to be based on the importance of the items. In a priority queue, the most important element will always be popped first, so in a priority queue you have to push a tuple of at least two elements: the priority and the content. The element with the lowest value for the priority will be popped. The following program populates a priority queue with random priority values and some text. it pops data starting with lowest priorities.